God’s own country, kerala leaves you spell bound. This tiny state in the south-west of India, lodged between the Arabian sea on the west and the Western Ghats on the east is amazingly beautiful. Kerala has been named after ‘Kera’ or the coconut palm which is so fundamental to its landscape and economy. The land has been blessed with a long coastline and numerous beaches and is a vacation hotspot. Kerala is a happy harmony of red, green, yellow and blue. Historic monuments, some magnificent fauna and flora, glorious sunshine, miles of endless sea and stretches of yellow sand, is what makes kerala a perfect holiday package. I was fortunate to spend my last summer vacation in kerala. Summer may not be the best time to visit Kerala but some last minute plans led us to holiday in this awesome land. From the moment we stepped down from the plane, it was a series of aahs and oohs as we soaked in the breathtaking beauty of the land of coconut palms and cashewnuts.Visiting five different places we stay at a Club Mahindra resort at four out of five places. The ambience in each resort matched the landscape of the land. Kochi is a city steeped in history. The city essentially comprises a group of islands, namely Willingdon island, Fort kochi, Mattencherry and a few others.The Arab, Dutch,Portguese influences are all very palpable in Kochi.The Saint Francis Church, built in 1503, happens to be the oldest European church and also the burial site of Vasco da Gama , whose remains were later moved to Lisbon, Portugal. His tombstone in the church is quite a tourist attraction. Mattencherry in Kochi is a neighbourhood about nine kilometers away from Ernakulam district and a popular tourist destination. Populated by various communities and cultures, Jew town is the historical part of Mattencherry. It was here that the ancient Jews began trading. Numerous versions abound regarding the existence of the Jews in Kerala. Legend has it that there were once thousands of Jews in Kerala but today their numbers have dwindled to not more than sixty.As per some records dating back to the 17th century written in Hebrew, the first Jews sailed to South India on the ships of king Solomon. Other records tell of the Jews coming to India during the Babylonian exile. Some records say that they fled to Malabar after the destruction of the second Temple. Most of these stories centre around an ancient trading centre called Cranganore, north of Cochin. In the early sixteeneth century there was a mass exodus of Jewish refugees from the Spanish and Portuguese invasions. Stroll down the lanes and bylanes of Jew town now flanked by antique showrooms, drink in the old world charm and rejuvenate mind and body. The Jew place and Jew synagogue are important landmarks. True to my sun sign I am a waterbaby.The golden sands and mighty ocean at Cherai left me feeling like a cat who got the cream. Willingdon Island is a man-made island named after Lord Willingdon, a former British Viceroy to India. The islands boast the best hotels in the city of Kochi and serves as the Port trust headquarters of the Southern naval command, Cochin Harbour. You can’t leave Kerala without experiencing its wildlife. The Periyar Tiger Reserve is spread across the dense Evergreen deciduous forests and grasslands of Thekkady and is home to a number of wild animals like the elephant, tiger deer, etc.Sighting the animals as they come to drink from the artificial lake across the Periyar river is an unimaniginably exciting experience. The sightings can be done from a boat cruise, trek, or a jeep safari. Sometimes it is your lucky boat cruise and sometimes it is not. We were fortunate enough to spot a few deer quenching their thirst. The early morning hours and late afternoon are the best times to go on these expeditions as it is then that the animals generally make an appearance. The watch towers in the forest enable tourists to watch jungle life close at hand. It is believed that kerala’s spice connection is about 3000 years old. History tells us that travelers from various countries flocked to Kerala to partake of its myraid spices. Cloves, cardamom, mace, nutmeg, ginger and turmeric all grow in abundance.Vasco da Gama too ventured into India to avail of his slice of spice. Spice gardens and plantations abound all over Kerala. Our tour of one such spice garden in Thekkady saw us breathing in the heavenly fragrances of myriad spice plants growing all around us. Besides spices there were a number of fruits and vegetables too. Some exotic, some commonplace. Spice plantations may also offer accommodation or a ‘homestay’on the plantation where guests savour traditional home cooked Keralite delicacies and simply enjoy the wonder and beauty of nature. Are you a tea drinker? Then make your way to Munnar.Lose yourself in the winding lanes, extensive tea plantations, rolling hills, waterfalls and babbling brooks. The winding roads did not go down too well with me. (motion sickness victims , carry your stock of tabs along! )The very picturesque hill station is situated at the confluence of three rivers and was once the summer resort of the erstwhile British government in South India. In fact the word Munnar means ‘three rivers.’Munnar’s breathtaking beauty makes it a popular holiday resort. Besides some very fascinating fauna and flora, the hill station boasts of having the highest peak in South India – Annamudi at 2,695metres is a trekker’s delight. 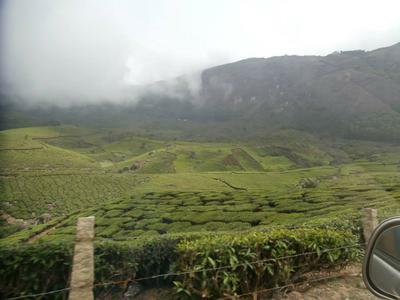 The Eravikulam National Park is home to a plethora of varied animals, birds and butterflies and offers a stunning view of the tea plantations and hills. The main attraction in the park is an endangered species of the mountain goat caslled Nilgri Tahr. The hills of mUnnar take on a bluish tinge every 12 years when the Neelakuringi flowers. The next flowering will be in 2018. The Tata Tea Museum in Munnar located in the Nallathani estate tells the story of the evolution of tea plantations in the hill station through old machinery, photographs and curios. The CTC manufacturing unit showcases the old method of tea production, while you savour a variety of flavours in the tea tasting unit.Furniture from the colonial era which includes wooden chairs, tables, iron ovens and some office furniture used on the tea estate are displayed at the museum. View the magnificent valley from the Mattupatty dam, Devikulam, Kundala lake and the Kolukkumalai lake. Scream your loudest at Echo point, 15 kms away from Munnar and wait a moment! The waters beckoned once more and to Ashtamudi in Kollam we proceeded. The Ashtamudi lake is a large palm shaped eight-armed water body and a popular tourist attraction. Also known as the gateway to the backwaters, Ashtamudi means eight coned. The 16km long lake empties itself into the Arabian sea through the Neendakara estuary. The coconut groves and palm trees along the shores of the lake simply enhance the splendor of the landscape. The backwaters comprise a network of waterways, inlets from the sea, estuatries, lakes and natural canals connecting coastal towns. The waters are teemimg with aquatic life and cruising he backwaters could be the best thing that could happen to you in Kerala. At Club Mahindra we stayed in one of the numerous wooden floating cottages. The cottages overlook the placid lake waters. Our fishing expedition from the balcony of the cottage provided for much excitement. The first-time fishermen – offspring and father – went hook line and sinker to fish( all provided by the resort).Undoubtedly their patience was rewarded sometimes with a single fish sometimes with a couple. ‘Happiness is…getting lucky on your very first fishing expedition.’ The resort might even cook the fish for you! Gazing at the tranquil waters is unadulterated for body, mind and soul. The resort arranged for an hour long houseboat cruise which to me was the best part of the holiday. The District Tourism Promotion Council and other private and government organizations arrange for boat rides as well as houseboat cruises. On the eight-hour long cruise between Kollam and Allappuza you discover the network of waterways that is so unique o kerala.Some houseboats are equipped with fully a furnished kitchen, bedrooms and bathrooms. You could spend a night on the boat and be treated to a typical Keralite meal and chill out with some beer. Yummy, yum, yum! When in Kerala, tuck into the ultimate Keralite cuisine. From Appams to Avial it just gets better and better. Carry away a little of Kerala with you. Go home with loads of spices, cashewnuts, tea, coffee, handicrafts and coconut products. Massage your woes away with an energizing Ayurvedic massage available at most resorts. There is so much to discover, to experience, put Kerala on your bucket list. Air: Kerala is well connected to all parts of India by air, rail and road. The three airports, namely Kochi airport, Thiruvananthapuram airport and Kozikhode airport serve domestic and international flights. There are direct flights to kochi from all over India. The kochi airport also serves the Middle eastern and South East Asian countries to Kerala. Rail: There are frequent rail services from Tamil Nadu and Karnataka and weekly services from Delhi and Mumbai. Road: Make use of the bus services available or rent a car and travel at your convenience on NH 47. WHERE TO STAY: there are a plethora of options to choose from. From high-end hotels like Taj Malabar at Willingdon to three star properties (kovalam beach resort and Kumarakom Lagoon) and cozy cottages there is a something that suits every wallet. In smaller towns you will find more functional properties.